This memorial website was created in memory of our loved one, Marcia Strassman, 66, born on April 28, 1948 and passed away on October 25, 2014. Where Marcia Strassman is buried? Locate the grave of Marcia Strassman. 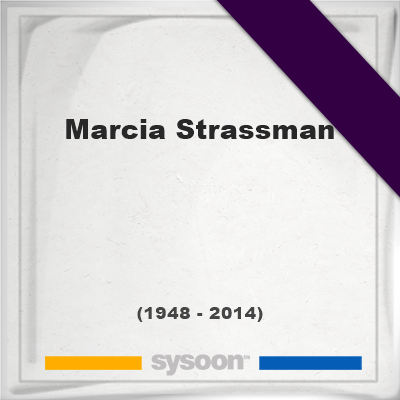 How to find family and friends of Marcia Strassman? What can I do for Marcia Strassman? Marcia Strassman was an American actress and singer, best known for her roles as Julie Kotter in Welcome Back, Kotter and as Diane Szalinski in the 1989 feature film Honey, I Shrunk the Kids; its sequel Honey, I Blew Up the Kid; and the 3-D film spin-off Honey, I Shrunk the Audience!, which was shown at several Disney theme parks through mid-2010. Note: Do you have a family photo of Marcia Strassman? Consider uploading your photo of Marcia Strassman so that your pictures are included in Marcia Strassman's genealogy, family trees & family history records. Sysoon enables anyone to create a free online tribute for a much loved relative or friend who has passed away. Address and location of Marcia Strassman which have been published. Click on the address to view a map. Marcia Strassman was born in United States. Marcia Strassman died in United States.